There's a charming little story to the birth of the beautiful skiing resort of Vaujany. The village was a sleepy Alpine community until France's largest hydro-electric scheme was built on its doorstep in the late 1980s, paying villagers millions of Euros a year in rent for the land they took. 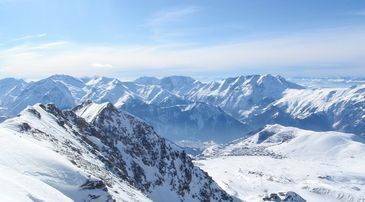 The locals used that cash to develop the ski resort that you see today, with access to the fantastic Alpe d'Huez ski area. It's still a sleepy Alpine community in many ways today, and the resort has been built in traditional style, with families and cosy nights in mind. Further, most of that money was spent on the very best modern lifts rather than huge apartment blocks. Vaujany remains small and pretty. Although it's very modern, it's been tastefully developed and looks Christmas-card pretty under a blanket of snow. Although, Vaujany is small, its après ski scene is growing and the resort now offers more off-slope fun. It's certainly not for party animals, and is well suited to families, but does offer a good deal of entertainment, coupled with good pistes. Vaujany's own ski area is shared with the older resort of Oz en Oisains over to the east on the way towards Alpe d'Huez. 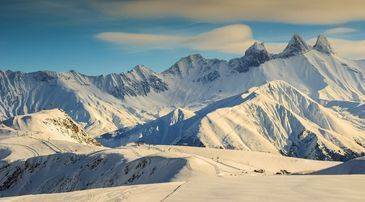 Vaujany is at 1,250m, and the main peak above the two resorts is the Dome des Petite Rousses at 2,800m, under the Glacier des Rousses and the Pic Blanc, the high point that dominates the whole Grand Domain ski area of Alpe d'Huez. Vaujany-Oz has 32.9km of runs in 30 pistes: 7 green, 11 blue, 9 red, and three black. The lifts are fast and modern with two cable cars and six gondolas among its 25 lifts, taking skiers to skiable slopes from 1,650m to 2,800m, a vertical range of 1,150m. Snow cover is usually good at this altitude. There is good skiing for all levels around Vaujany, but the wider ski area is very well linked, and getting the most out of both is easy. Montfrais is a good place to start, and the nursery slopes above the village are some of the best for kids you'll find anywhere. Les Rousses is where the serious skiing starts, with some good runs, including a long easy piste, Bartavelle, that runs all the way down to Alpette. The Vaujaniate run (blue) is popular and takes skiers to the top of the Vaujany Villette gondola, the closest you can get to skiing into the village. For a more challenging descent, try La Fare, a black, to l'Enversin d'Oz. Try the Champagne run while you're at it. There is a small snow park at Montfrais that is aimed mostly at beginners. There are 30km of cross country tracks in two circuits: Circuit des Lacs and Boucle de Poutran which are accessible via cable car. 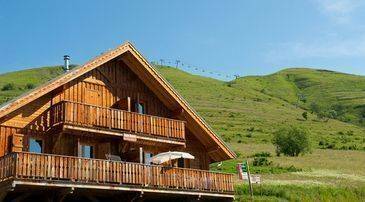 The Alpe d'Huez Grand Domain takes the skiing at Vaujany up to the next level. In total, the ski area has 250km of skiable runs, divided into 42 greens, 37 blues, 39 reds and 17 blacks with 84 lifts, including six cable cars and 10 gondolas. There are 900 snow-making machines, covering 75km of the slopes, adding extra insurance to Alpe d'Huez's average annual snowfall of over 3 metres. There is lots of great skiing in varied terrain in this famous old ski area. The nursery slopes above the village are among the best rated in the entire Alps. The Pic Blanc towers above it all at 3,300m, and there is lots of more challenging skiing to enjoy too. Pic de la Pyramide starts very steeply but eases up as you down one of the ski area's best off-piste runs. You can also traverse the Grand Sablat glacier for some more spectacular views. Piefroid has some beautiful runs and off-piste routes down to Clavans. An interesting way to get home to Vaujany is the P10 Coulouir, with its natural half pipe. 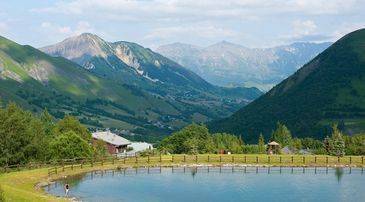 Investment in Vaujany has included providing a very good sports centre, L'Espace Loisirs, which has a 25m pool with water slides, children's pools, a gym and good spa and wellness facilities. There is skating at a large indoor ice rink. A guaranteed snow cover area for tobogganing at the sports centre is complemented with a higher level one at Alpette. The resort runs snowshoe walks too, and there's a four-lane bowling alley. The sports centre hosts gigs and other entertainments from time to time. There are lots more activities, on and off snow in the Alpe d'Huez resorts. The slopes around Vaujany are well served for mountain restaurants, and while the village itself is not swamped with eating places, they tend to be good quality and great for families. On the mountain, Les Airelles is very popular for traditional mountain food and the Auberge de L'Alpette is great quality  both are handy for the nursery slopes. La Grange and Chez Passoud are also worth trying. On trips to Alpe d'Huez, La Cabanne du Poutat is for serious foodies. L'Altibar gets the local vote, and there's a new branch of La Fruitiere, the Val d'Isere favourite. In town, try Table de la Fare or the restaurant of the Hotel Cimes. La Remise serves mountain classics and pizza, while L'Aigle Royal is good for snackier meals, and Stief's has lots of child-friendly dishes. Again, Alpe d'Huez has more and livelier options, but Vaujany does have its own special vibe. Start the party whilst still on the slopes at the legendary Folie Douce. Back in Vaujany, Arsen's Internet Café has international sports on TV, while the terrace at Table de La Fare is a good spot for early après. Stief's stocks excellent Belgian beers, and free riders and boarders seem to head to L'Etendard. Although there's only one nightclub, Shooters, it does offer dancing till 4am. The ski season is of a fairly standard length, opening from early December until late April. A dedicated website sells passes for both Oz-Vaujany and the Grand Domaine ski area. Children under 5 years can use the lifts for free, as can adults over 71. Children's discounts apply to children up to 12 years, seniors get a discount from the age of 65. Passes are available for everything from 3 hours to 7 days, with 6-day passes for families available at another discount. There are only two ski hire shops in Vaujany itself. Book in advance online to save money and hassle or in addition to your accommodation booking with Madame Vacances to get a 30% discount. Vaujany has several English-speaking schools, including a branch of ESF, the largest French snow school. There's a special class for women and girls at Active Ecole Ski School, with a body treatment thrown in. There are a number of local independent teachers and guides, who can help you make the most of the more demanding off-piste skiing. The resort has a government Famille Plus status for its family-friendly facilities. There is a day nursery for children from the age of 6 months to 3 years with lots of activities, including early trips into the snow. You can book by the half-day or for longer periods, and it's a good idea to book ahead online. ESF runs kids clubs and lessons for very young children on good quality nursery slopes above Vaujany. There is free covered parking around the village shops and in the central square. If you are driving to the alps, make sure your vehicle is correctly equipped with the either winter tyres or snow chains.